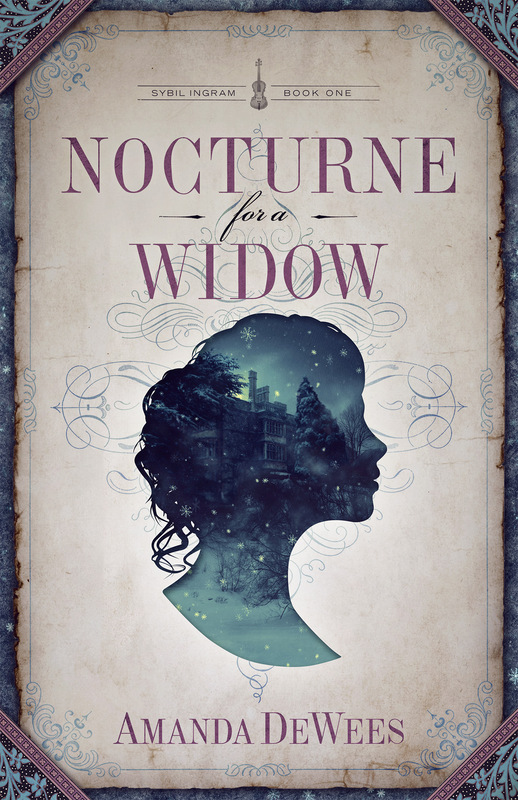 First off, how much do you love that cover for Nocturne For a Widow? I love the colors, the composition, and most of all that silhouette. Widowed on her wedding night! Sybil Ingram is at a crossroads. Once she was the toast of the London stage, but by 1873 her draw isn’t what it used to be, and her theater troupe is foundering. When her trusted mentor asks her to take the blame for his financial misdeeds, Sybil sees no choice but to retire from the life she loves and move to America to marry New York City hotel magnate Alcott Lammle. But her path to happiness is cut short when Lammle dies suddenly–and in financial ruin. Widowed, nearly penniless, and unable to return to England, the determined diva sets out to stake a claim on Brooke House, an eccentric Gothic revival manor in the wilds of the Hudson River Valley. She soon finds, however, that a ghostly presence wants her gone. Even worse, her claim is challenged by the most insolent, temperamental, maddeningly gorgeous man she’s ever met: Roderick Brooke, a once-famous former violinist whose career ended in a dark scandal. Soon it’s a battle of wills as Sybil matches wits–and trades barbs–with Roderick, finding herself increasingly drawn to him despite her growing suspicion that there is a connection between him and the entity that haunts Brooke House. But an even greater threat arises in the form of the mysterious, powerful queen of local society, Mrs. Lavinia Dove. For reasons that Sybil can’t imagine, Mrs. Dove is determined to oust Sybil from her sphere . . . and the lengths to which she will go are chilling indeed. By turns mysterious and moving, sparkling and spooky, Nocturne for a Widow follows a spirited heroine through adventures in life, love, and death. From the colorful theatrical world of late-Victorian London to the American wilderness, Sybil’s travels will test her mettle–and her heart. As I was reading Nocturne For a Widow, two authors’ works kept coming to mind: Barbara Michaels’ historical Gothics, and Deanna Raybourne’s Lady Julia Gray mysteries. It’s hard to heap higher praise on an author than to compare her to either of those authors, both of whom weave important but too-often overlooked elements into their spooky tales — wit and humor. It’s a hard balance to strike, but like Raybourne and Michaels, Amanda DeWees does it wonderfully. 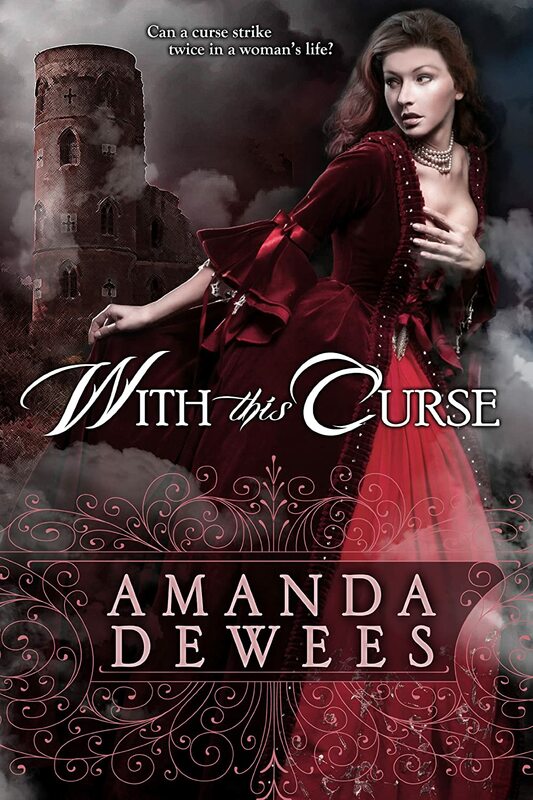 If you’ve found Gothic romances too cobwebby and suffocating, then DeWees’ books, especially Nocturne For a Widow, will disabuse you of those notions. A sprinkling of cheeky wit was but one of the standout features of DeWees’ Gothic historical debut, Sea of Secrets and her follow-up Gothic With This Curse and with Nocturne For a Widow, she brings that delicious humor to the forefront, creating characters and a plot that balance classic Gothic suspense and lighthearted humor so deftly that she nearly creates an entirely new genre — the cozy Gothic romance. We Gothic lovers are unused to heroines who are not the overlooked governess, the plain-but-bright orphan, or the tragic beauty, which is why Sybil Ingram is such a revelation. Beautiful, vivacious and ever-so-funny, Sybil makes the perfect foil for each and every pathos-laden situation DeWees throws her way, from marrying for money only to find herself widowed immediately to arriving at a desolate and clearly disturbed estate to dealing with unhinged would-be spiritualists. She’s never daunted, never cowers, and if Sybil blunders into that proverbial dark at the top of the stairs more than once, it’s never for being too clueless to know better. 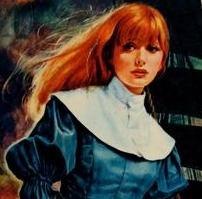 Our Sybil’s just that fearless and self-assured, two few-and-far-between qualities in the Gothic heroine. It spoils nothing to reveal that Sybil goes to Brooke House expecting a pitifully neglected young stepson to go with the forgotten estate, only to find that her stepson is fully grown and anything but pitiful. That’s where our hero, Roderick makes his stomping, bellowing and unforgettable entrance. No Gothic romance is complete without a haunted hero, and Roderick Brooke is one you’ll remember long after you’ve put Nocturne down. Roderick is, in fact, where the Barbara Michaels connection comes to the fore; if you loved Michaels’ Master of Blacktower and its blustering, howling and yet endearingly vulnerable hero, Gavin Hamilton, then Roderick Brooke is just the hero for you. His and Sybil’s interactions crackle with chemistry, and theirs is a happy ending that you hope is just the beginning. And is it just a beginning? If you paid close attention to Nocturne’s gorgeous cover, you couldn’t have missed “Sybil Ingram: Book One” at the very top. It’s my dearest hope that this is but our first adventure with Sybil and Roderick, and that we can look forward to more of their fabulous chemistry together to come. I give Nocturne For a Widow five suitcases that just won’t stay where you leave them. I know you’ll just love it. Categories: 5-Star Read, Cover Art, Gothic, Historical Romance, Lovely Romance Novel Covers, Reviews, Suspense | Tags: 5-Star Read, Amanda DeWees, Barbara Michaels, Deanna Raybourne, Gavin Hamilton, Lady Julia Gray, Nocturne For a Widow, Roderick Brooke, Sea of Secrets, Sybil Ingram, The Master of Blacktower, With This Curse | Permalink. This book’s so obscure, this is the best image I could find of the original cover. One of the top ten lines people use when dismissing romance novels is inevitably if you’ve read one you’ve read them all. Well guess what? The same can be said of sitcoms, Sci-Fi books/movies/TV shows and even reality TV shows. Hell, John Wayne and Clint Eastwood made careers of making the same Westerns over and over. I do most of my romance reading in the Traditional Regency and Regency historical genres, and there are times when I just want to read something… different. No rakes, no Almack’s, no obligatory meeting in the library in the dead of night. But Carla Kelly and Elisabeth Fairchild can only write so many books, bless their hearts, which means I spend a lot of time reading synopses and gnashing my teeth, because they all sound so much the same. Take for instance Gentleman’s Folly by Cynthia Bailey-Pratt. Jocelyn Burnwell lived in the everyday world of housekeeping and looking after her rather mischievous cousins. But one day she helped save a dashing, mysterious gentleman’s life. And her world changed forever. Who was this elusive Mr. Hammond, this master of disguise and man of a thousand unanswered questions? Jocelyn knew only that he carried with him a letter from Napoleon; she didn’t know that the fate of England depended upon Hammond–or that she was about to embark on a grand and treacherous adventure! As she left her docile life behind and set forth with this intriguing hero, she also felt a stirring in her heart–of a love without rhyme or reason…. Jocelyn Burnwell was caring for her mischievous cousins in her domestic world when she saved a stranger’s life. Mr. Hammond turned out to be a master of disguise who had a letter from Napoleon—which could determine England’s fate. So Jocelyn set out on an adventure with this dashing, mysterious gentleman—an adventure that would change their lives. Mischievous Cousins — when I see “mischievous cousin,” my mind reads irritating plot moppet. Plot moppets are the locusts of the Regency, and usually appear either to serve as a plot device to draw H/h together or to make “kids say the darnedest things” remarks revealing wisdom beyond their years. The good news is, plot moppets most often conveniently disappear altogether for pages and pages at a time, then pop up when the plot needs them. Hate ’em. Master of Disguise — all I despise more than a mischievous cousin is a master of disguise. Unfortunately, they’re thick on the ground in Regency romances. Cue the: A. heiress posing as a governess; B. the gently-bred lady passing as a boy for nothing more than a pair of nankeens and a bit of binding; or C. the spy posing as a fop, complete with thirty watch fobs and quizzing glass. Heiresses posing as governesses and spies as fops are one thing, but the woman-dressed-as-a-man trope takes the prize for my least favorite disguise, simply because it’s so rarely done well or believably. Letter From Napoleon (indicative of spy status) — if there had been as many spies at work during the Napoleonic Wars as show up in Regencies, there would be a lot fewer Regency romances, because the war would have been dispatched with posthaste. Unless, of course, they were Regency romance spies, who are often fooled by women dressed as boys and all too willing to drop whatever intrigue they’re pursuing when they meet the heroine. Suddenly there is absolutely no urgency about their errands, and they almost always trust the heroine (almost always a stranger) implicitly from first glance. Somehow, however, they’ll manage to remember the intrigue in time to wrap it up in the last quarter of the book. Fate of England Depends Upon (Insert Hero’s Name Here) — as common as the spy in Regency romance is the military hero or the duke-who-simply-cannot-abandon-his-responsibilities-at-home-but-contributes-to-the-war-effort-by-doling-out-Very-Important-Advice who manages to have the fate of the nation upon his broad, manly shoulders. If he’s a military hero, you can bet that he’s Wellington’s right-hand man, or that Wellington would be nothing without him. If he’s a spy, he’s the best in the business and has the one bit of intelligence that will change the course of the whole war. If he’s a peer, then Lord Castlereagh doesn’t make a move without consulting him first. As if having the fate of the nation on those manly shoulders were not impressive enough, these heroes are almost always to the manor born, so to speak. We’re inevitably told that military heroes bought commissions just to join in the war effort, which of course means they had no training or practical experience prior to the war. They’re just natural born leaders, understand. Likewise spies often need no more than a good French accent to glean all the information they need to save the nation — everything else is managed by sheer force of will and personality. The Lords SuchandSuch are clearly savants one and all. Little else can explain how they gain all this wisdom they impart to Castlereagh, considering their relative youth (they’re rarely more than a shade over 30, if that) and all that time spent dodging matchmaking mamas at Almack’s or Vauxhall Gardens. It’s a good thing they are always so humble about everything, and never but ever want anyone to know just how much Castlereagh relies on them. Otherwise they’d just be insufferable. A Grand and Treacherous Adventure! — otherwise known as a semi-valid workaround for the constricting mores of the day. There were few legitimate opportunities for unmarried females to be in the company of men of no familial relation during the Regency period. Young, unmarried ladies required constant supervision, you know, or else they’d forever be haring off on some Grand and Treacherous Adventure! just to have an excuse to be alone with a suitable hero. 4. the inevitable shotgun wedding when the heroine’s family, oddly absent/generally uncaring during this whole Grand and Treacherous Adventure!, finds out she’s been compromised and demands she be wedded. Points are awarded if the heroine (or a plot moppet) also does something(s) adorable but stupid which blows their cover, endangers their lives and results in them losing every last sou. So far, it’s not looking good for Gentleman’s Folly, but something compelled me, and I pressed on. Little in the first chapter impressed me. Before we’re five pages in, Jocelyn, our heroine, has dressed as a boy to divert the authorities from catching that mischievous cousin of hers, Arnold, who is the world’s most precocious poacher, hit a constable over the head with a gourd and generally behaved like featherbrained girl. Hammond, despite being injured in the line of spy duty, has to rescue her from a soldier who claims she pickpocketed him. Although she must needs divest herself of her cousin’s coat to rinse Hammond’s blood out before it stains (yes, you read that right) and to bandage him up (though she neglects this duty until he all but begs her to), he still never notices she’s a girl. Granted, he is busy stuffing that all-important letter from Napoleon into the lining of her coat, for reasons I’ve still yet to understand. more coincidences than Prinny has mistresses. But despite all this, it works. Yes, it works. It works beautifully. Bailey-Pratt manages to employ almost every stock element known to exist in Traditional Regency romance, and in doing so proves how some of these familiar Regency tropes became popular. The unworldly country-bred heroine is one of the Traditional Regency’s most frequent flyers, right up there with the poor downtrodden heroine forced to live off the charity of her relations, and at first blush, Jocelyn seems no different than a hundred other similar heroines. Then she surprised me by refusing to fall head over heels for Hammond within the first three chapters. More surprising still, when she does begin to feel a distinct stirring of feelings for the rogue, she shrugs it off as nothing more than an exciting change from the usual humdrum. Her feelings for him develop in intriguing fits and starts as he reveals himself as kind, funny and honorable. Jocelyn is so refreshingly normal. Sometimes she’s stubborn and silly, but mostly she’s just a harried young woman left in charge of her relatives’ ramshackle household. Not only is she not Mary Poppins-esque in her complete mastery of all domestic tasks, she’s often the opposite — she lets her cousins’ rooms go to dust and moths and allows the youngest to accumulate a nice coating of dirt that she cheerfully tells him needs drowning to remove. The only fault I found with Jocelyn is that she’s often no more than a linchpin, the still point of the action that’s going on around her. Then there’s Hammond. I almost cringed when he quickly identified himself to Jocelyn as a spy, and not only because I thought of course he trusts her implicitly, despite barely knowing her. I waited for him to prove out to be a sorry excuse for a spy, but wonder of nine days’ wonders, Hammond is indeed an actual working spy. With results both comic and exciting, he spends (or wastes, depending upon his mood) days trying to flush out the villains at work in Jocelyn’s village and get back the famous coat and the letter inside. It soon becomes obvious that he revealed himself to Jocelyn just to play upon her youth and trusting nature, something he’s not above doing several times in the book. He’s also not above letting someone else come to her rescue if he’s got bigger fish to fry. He’s got a job to do, and if he just so happens to encounter Jocelyn as he does it, great. If not, she’ll just have to wait. And he really is a master of disguise — Bailey-Pratt’s descriptions of the subtle ways he changes his appearance are delightful. If it sounds like Hammond’s a first-rate cur, trust me, he’s not. He never gets anywhere near compromising Jocelyn, but neither does he always try to exclude her from the action Because She’s a Female and Must Be Kept Safe. By the end of the book, even I was believing him as the Spy That All Other Spies Admire and Wish to Be. Which brings us to the plot moppet, Arnold. He’s the most wonderful awful boy, sort of a cross between Opie Taylor and Dennis the Menace, always up to no good. But it’s no wonder — poor kid’s being raised by wolves who routinely leave him with Jocelyn and a rotating cast of housekeepers who leave within hours or days. He lies, he carouses, he wants candy. Jocelyn no longer dreams of having children of her own for fear they will be like Arnold, and Hammond sums him up best by saying that while he can appreciate Arnold, he’d rather not have one just like him, since he likes sleeping at night. Even the lesser cliches are employed with the utmost care. The Grand Lady really isn’t that bad — she’s nursing a surprising tendre is all. Not all the coincidences are quite so coincidental, after all, when it’s all wrapped up at the end. And if everyone this ragtag bunch meets on their Grand and Treacherous Adventure! is shockingly helpful, then it’s likely because they, like us as readers, just seem to be enjoying these characters so much. So why does a book, built as it is like a house of Regency pattern cards, work so well? Bailey-Pratt uses these tropes as touchstones, rather than let them do the work of creating characters and plot. There’s nothing inherently wrong with any of the cliches that Bailey-Pratt and so many others use in Regency romance. They are no more cliched, in fact, than any other romance novel cliches. If we automatically roll our eyes when we see these stock elements in a Regency novel, then it’s because we’ve so often seen them abused. Well-worn tropes are the lazy author’s best friend, the writing equivalent of a paint-by-numbers kit. By using stock characters like the rake, the country-bred ingenue, the foppish dandy and the matchmaking mama, the author bypasses the difficult job of character development. We all recognize these characters, and have a mental picture of them ready to slot in to the author’s space. Framing the story around familiar plot points and situations achieves the same goal. Trust that I am not damning Cynthia Bailey-Pratt and Gentleman’s Folly with faint praise, because this is a book I have returned to time and again, though I still don’t know why. I give Gentleman’s Folly 5 stolen kisses, Hammond 5 hats to employ in various guises, and Arnold 5 pieces of lint-and-dust-free candy. I have absolutely no idea how I came to have this book on my old Aluratek e-reader, but it’s been there three years or more. It wasn’t recommended to me. I didn’t find out about it from a review, because the only review I could find when I wrote this was one I posted at Amazon. I didn’t buy it from Amazon, either, or it would be on my Kindle. It’s a mystery to me. Also — no apparent reason for this book to be titled Gentleman’s Folly, and can someone please help me understand why so many books I love have awful covers? The only element in the original cover for this book that has anything at all to do with the story is the cane the erstwhile Hammond is holding. Categories: 5-Star Hero, 5-Star Read, Rediscovered, Reviews, Romance, Traditional Regency | Tags: 5-Star Hero, 5-Star Read, bad romance novel covers, Cynthia Bailey-Pratt, Gentleman's Folly, Regency, review, tropes | Permalink. Susanna and the Spy melds two of the romance’s best subgenres — the gothic and the traditional regency. While the book has the Napoleonic War setting and slow-burn sensuality of the Traditional Regency, it also features many of the conventions of the Gothic: woman in peril (in this case almost-governess, penniless Susanna), a family estate complete with unexplained deaths and a mixture of kind and not-so-kind family members, a dark, dangerous, very evocative hero and a mystery to tie it all together. It’s Victoria Holt crossed with Elisabeth Fairchild, what with Ms. Elliot’s fluid, lovely prose and the excellent story. You’ll love getting to know Susanna, and fall in love with James, the book’s hero, right along with her. Categories: 5-Star Hero, 5-Star Read, Goodreads Review, Gothic, Reviews, Traditional Regency | Tags: 5-Star Hero, 5-Star Read, Anna Elliott, book review, Susanna and the Spy | Permalink. Have you ever read a book once, and thought meh, then went back again and found it a totally different book? That’s me and Lady Elizabeth’s Comet. Part of my problem when first reading Lady Elizabeth’s Comet was, unfortunately, Lady Elizabeth. Lady Elizabeth is as near to an anti-heroine as you’ll find in a Traditional Regency. She’s short-tempered and snobbish, often treating the hero (and various other characters in the book) unkindly or dismissively. Interested more in astronomy than the people around her, it seems amazing that Lady Elizabeth could somehow attract not one but two suitors, her father’s heir, Tom Conroy, Lord Clanross, and Clanross’ close friend, Lord Bevis. But as it turns out, some of the same pejoratives I applied to Lady Elizabeth applied to me as a reader, at least on my first go round with Lady Elizabeth’s Comet. If you stick with the book long enough to make friends with Lady Elizabeth, you’ll find she’s also funny and smart, and eventually all-too-aware of her own shortcomings. I won’t spoil the book for you by revealing which of her suitors Lady Elizabeth chooses, but I will say that although Lady Elizabeth is one of the least romantic female leads I’ve ever personally encountered, the romance that develops almost painfully slowly over the course of the book is delicious. It will remind you more of an Austen romance than even a Heyer romance. I find myself returning to Lady Elizabeth’s Comet when I’m burned out on trite or trope-filled Traditional Regencies, or just want a great example of everything that is wonderful about the Traditional Regency genre. Categories: 5-Star Hero, 5-Star Read, Classics, E-books, Goodreads Review, Rediscovered, Reviews | Tags: 5-Star Hero, 5-Star Read, Lady Elizabeth's Comet, Sheila Simonson, Villains and Anti-Heroes Week | Permalink. If the e-book revolution has done one thing for romance readers (aside from making us less ashamed of reading romance), it’s the fact that it’s given new life to hard-to-find and out-of-print romances, helping bring buried treasures into the the light. I can think of no better example than Lord of Vengeance by Lara Adrian. Taken captive by Gunnar Rutledge, a dark knight sworn to destroy her father, Raina d’Bussy must teach forgiveness to a man who knows no mercy and lives only to exact revenge on his enemy. But time in Gunnar’s keep stirs an unwanted passion in Raina, and something far more perilous, when she finds herself falling in love with the one man she should never desire. For Gunnar, vengeance is all that matters. He seeks the ultimate price from his enemy’s beautiful young daughter, claiming Raina as his hostage. But the proud beauty defies him at every turn, tempting him like no other. Setting out to break Raina’s glorious spirit, Gunnar instead finds himself bewitched by her goodness, her strength. Can he seize the justice he is due without losing Raina forever? Lord of Vengeance made quite a splash when it was originally published under Adrian’s pseudonym, Tina St. John, in 1995. The book won the Romantic Times Reviewers Choice Award for Best Medieval Romance of the Year, and was a HOLT Medallion Finalist for Best Historical Romance of the Year. But like all save a select few romance novels, within a few years the book was out of print, and largely forgotten. Lara Adrian, however, went on to write a number of paranormal romances. Now, she’s brought the medieval romances she wrote as Tina St. John back out in e-book format. Since I missed Adrian/St. John’s books the first time around, I’m so glad to have found them now. I have to confess I’m not a big fan of medieval romances, so I’m not sure why I decided to buy Lord of Vengeance, but I’m glad I did. Adrian/St. John takes a number of the romance conventions that have been done to death, especially in medieval romances — the revenge romance, the kidnapping romance, the big secret romance — and makes them both believable and entirely new. Gunnar’s obsession with avenging his parents’ death and his own terrible experiences at the hands of Raina’s father is understandable, but Adrian/St. John never lets the obsession veer into crazy; although he’s been damaged by his past, there are several times in the book when Gunnar himself begins to question his motives, as he begins to see how d’Bussy has changed and aged in the years since he murdered Gunnar’s parents. Adrian/St. John also eschews that other romance convention related to revenge — blaming the child for the sins of the father. Gunnar never allows his hatred for d’Bussy to color his feelings for Raina. The kidnapping, however, dovetails perfectly into Gunnar’s plans for revenge, and never seems forced (pun intended). In more romance novels than I care to count, a kidnapping serves only to sequester the heroine and hero for a period of time, so that they can realize how perfect they are for each other, and there’s rarely any but the merest hints that the victim is uncomfortable or distressed. While Gunnar and Raina do come to love each other while she’s in his keep, Adrian/St. John is careful to show Raina’s discomfort and anger at being held against her will. Although Gunnar never mistreats Raina for no reason, in more than one instance he’s compelled to treat her less than politely, and Adrian/St. John handles this well, and, in turn, so does Raina. Much of the plot of the book hinges on two big secrets that I won’t reveal for fear of ruining the book, but, again, unlike in many romances, the secrets are both believable and understandable, and, rarer still, serve to make the book’s two villains more human and more frightening; to me, a villain must have legitimate motives in order to be truly scary — evil for the sake of eeeeeeeevil is just cartoonish. But he saw her face at every turn, felt her softness in the brush of the summer air, smelled her essence in the waft of heather rolling off the hills. The sound of his name on her lips lingered in his mind… She was under his skin and in his blood, and he could not deny it. Lord of Vengeance is one of the best romances I’ve read in months. I give Lord of Vengeance 5 romps in the forest, and Gunnar gets 5 sprigs of heather, for remembrance’s sake. Categories: 5-Star Hero, 5-Star Read, Classics, Rediscovered, Reviews, Romance | Tags: 5-Star Hero, 5-Star Read, A Winter Ballad, Barbara Samuel, book review, Lara Adrian, Laurin Wittig, Lord of Vengeance, medieval romance, The Devil of Kilmartin, Tina St. John | Permalink.